The concept of barnacle SEO is simple enough: get visible on a site that ranks well in Google for the local search terms you’re going after, because that’s usually easier than getting your site to rank for those terms. (You’ll still try to do both, of course.) I’ve also written about the most-practical ways to execute it. (2) Most people overlook easy wins. (3) The payoff usually isn’t as obvious as, say, high rankings in Google. 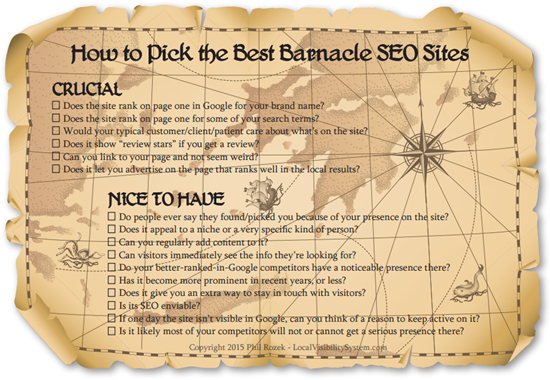 I’ve put together a checklist of all the ways (I can think of) that you can gauge the usefulness of a “barnacle” site. I hope it helps you figure out where to channel your efforts. Of course, there’s no site that meets all the criteria. Yelp, Facebook, and YouTube probably come closest. But those sites are saturated, and getting visible there may or may not be practical for you. 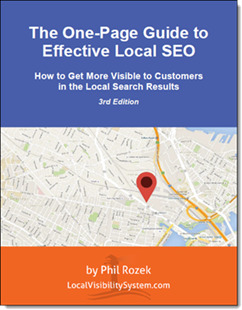 Just use the checklist to understand how one site stacks up against another, in terms of how it might help your local visibility. The trouble with an otherwise decent “barnacle” site like Angie’s List is that you’ve got to be a paying member to read the reviews. Even on the BBB (an overlooked place to get reviews) the reviews are a little buried. Not a reason to ignore either of those sites, but the semi-hidden reviews detract from the payoff a little bit. You can stay in touch with Facebook fans, YouTube channel subscribers, Pinterest followers, and the like. Maybe they’ll become customers (even returning customers) one day. 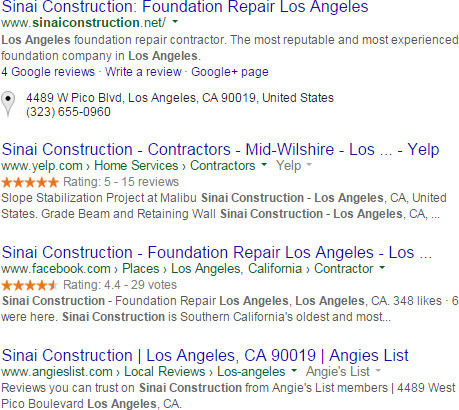 I’m referring to the point Nyagoslav makes in this excellent post, where he shows what a rock-solid job Yelp has done with its on-page SEO, and how that can indirectly help your business. Do you have a favorite “barnacle” site (especially an often-overlooked site)? How about a barnacle strategy that’s worked well for you / your client? Any questions about the checklist?